As Daniel Butcher walked onto North Port oval on the weekend for the blockbuster clash between Port Melbourne and Williamstown, he held the ball aloft for the 100th time at VFL Senior level. It is a far cry from running around the Heathcote League where it all started for Daniel. Persuaded into umpiring for some extra pocket money, he began umpiring junior district matches as a member of the Rochester-Echuca Umpires Association. He would work his way through the junior ranks and his first senior match came calling in the Heathcote Football League at the ripe age of 16. 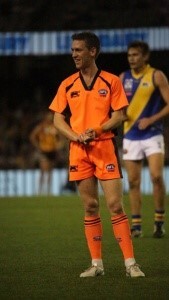 At the end of the 2010 season, Daniel was nominated to trial at the VFL in Melbourne. The kid from Lockington would travel down to Victoria Park to chase the dream. After a well-planned trip to Singapore, much to the distain of Kevin Mitchell in his trial period, Daniel was successful in gaining a spot on the VFL Development panel for 2011. He hit the ground running and soon found himself promoted to the Senior List at the beginning of the 2013 season. In the world of umpiring there are a lot of key moments that can define careers on whether you make it or you don’t. Daniel’s came at the end of the 2014 season in a year in which he umpired the TAC Grand Final. He missed out on a senior final and he could have gone two ways with his attitude. He chose to work hard over the Summer under the close guidance of Kym Brockhoff and come back and have a break-out season. “To miss out on the finals was disappointing but it gave me the drive to come back fitter and more determined than ever.” He certainly ticked those boxes and had a stellar year, achieving the ultimate goal at VFL level of umpiring the 2015 VFL Grand Final between Williamstown and Box Hill as well as being named umpire of the year. His success was rewarded with an AFL Rookie promotion at the end of the year where he spent the next two seasons attending training and sitting on the bench at AFL matches to improve his umpiring skills. The results of that experience speak for themselves as Daniel went onto umpire the 2016 and 2017 VFL Grand Finals- 3 in a row! A feat that has only been done once before. Daniel shares his success so far with the people that are closest to him- his family. “They have played a huge part in where I am today and without their support I wouldn’t have achieved anything like this” he says. His father, Ron, Mother, Dianne and siblings Briony, Matthew and Jacelle have been there every step of the way. There is no doubt you will hear a “hey bore” from the sidelines this week as Daniel completes his warm up. Throughout his whole umpiring successes, he has remained as humble as the day he left Lockington. He is a great role model for younger umpires and is often seen watching them in his spare time to provide them with the feedback needed to progress their umpiring in the way he has. He has given his time to the VFUA association serving as Vice-President and President in 2014 and 2015 respectively to which he has fittingly been awarded Life-Membership. On behalf of the VFUA and all the umpires that have had the privilege to umpire with you over the journey, congratulations on the 100 games; it is a great achievement and a testament to your application you have shown over the journey!